The editor who added this tag suggests: Upload more images of the black-and-white version. For the stage that originated in Super Smash Bros., see Dream Land (SSB). Dream Land GB across the series. Unlock criteria Use Kirby's Final Smash. Dream Land GB (プププランド GB, Pupupu Land GB), known as Dream Land (プププランド, Pupupu Land) in Super Smash Bros. for Nintendo 3DS, is a stage in Super Smash Bros. for Nintendo 3DS and Super Smash Bros. Ultimate, based off of Kirby's Dream Land. In Ultimate, it is renamed to distinguish it from the similarly-named Smash 64 stage. It is a transitioning and scrolling stage taking place in various areas of Kirby's Dream Land. As an added reference, all of the area's locales are rendered in an identical style to the original Game Boy's monochromatic screen; furthermore, the edges of the battlefield border resemble those of the Game Boy, complete with a red LED on the left border to show the life remaining in the Game Boy's batteries. When there are only five seconds remaining in timed matches, this light begins to dim, as if the Game Boy's batteries were dying out. The stage begins with the original Game Boy boot screen with the scrolling Nintendo logo, then quickly transitions to the Green Greens phase. Periodically, the stage will randomly transition between seven different phases, three of which scroll right before transitioning to another phase. If a player holds the L button while selecting the stage in Super Smash Bros. for Nintendo 3DS, it will use a black and white palette instead of green, mimicking later Game Boy models. This easter egg is absent in Ultimate. Green Greens: This section starts in a flat area with a door marked "In" in the background (this cannot be entered). After some time, a pointing hand appears and the stage scrolls right, passing over a pit and stopping at a cliff. Castle Lololo (exterior): The exterior features two platforms on the bottom. The bottom-right platform has three small platforms above it. Castle Lololo (interior): The interior has one bottom platform and three others arranged in a triangle. They are all hard platforms, so it can provide a cave of life. Float Islands: This section starts at the end of an island, while a ship's hull is visible. Characters are not able to swim in the water, though the water will make a splash effect when entered. After some time, a pointing hand appears and the stage scrolls right, passing over the ship to a pair of small islands with 2 platforms on each (the edge of the ship is also on screen). Bubbly Clouds: This section starts with four cloud platforms: two at the bottom and two at the top. After some time, a pointing hand appears and the stage scrolls right, stopping at three cloud platforms. Mt. Dedede (lobby): The Boss Rush lobby has one bottom platform and two platforms on the left and right sides of the stage. Mt. Dedede (boxing ring): The boxing ring is completely flat. In Super Smash Bros. for Nintendo 3DS, the Ω form is set in the Green Greens portion. It does not scroll and walk-off areas are absent. The "Game Boy" border is also not seen. Unlike its normal version, the stage appears in 3D. The black and white variant can still be accessed. In Super Smash Bros. Ultimate, the Ω form and Battlefield form use the background of the Green Greens portion, but the main platform resembles the wall design of the Castle Lololo exterior section. The platform is resized and reshaped to match Final Destination and Battlefield, respectively. The three soft platforms of the Battlefield form are small rectangles that are unique to this form. The characters are still flat, which also flattens the hitboxes and alters gameplay significantly as a result. Ω form (black and white) in Super Smash Bros. for Nintendo 3DS. A glitch can occur in the King Dedede's castle area of the stage causing the floor to "disappear". Players can randomly fall onto the lower blast line where it is impossible to get KO'd. Another glitch can occur where one of Olimar's Pikmin will become stuck below a platform that is not drop-through. The Pikmin will continue to be in its falling animation, but will still follow Olimar until he goes out from above the platform or until the stage shifts to a new section. Screenshots of Green Greens (left) and Castle Lololo (right). 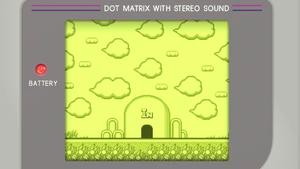 Kirby's Dream Land was a game debuting on the original Game Boy, with five stages. Players controlled Kirby as he traveled through Dream Land, picking up food, Superspicy Curry, Maxim Tomatoes, and 1-Ups. The five stages were Green Greens, Castle Lololo, Float Islands, Bubbly Clouds, and Mt. Dedede. Mt. Dedede was the last stage, and upon clearing it, players were given the option to begin again in a more difficult "Extra Game". 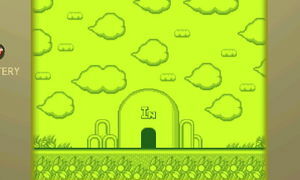 Dream Land GB uses a frame based on the original model of the Game Boy, which featured a green, monochromatic screen. The stage accurately reproduces the Game Boy's display, including the red battery light and "DOT MATRIX WITH STEREO SOUND" text. In Super Smash Bros. for Nintendo 3DS, the stage can also be displayed in shades of gray, which resembles later models of the Game Boy, such as the Game Boy Pocket. Monochrome variant of the Lololo interior. Dedede's ring, as it originally appeared in Kirby's Dream Land. The light will dim when there's only five seconds left in a timed match. The Pic of the day from August 8, 2014 that features the monochrome Kirby and King Dedede costumes further references Kirby's Dream Land, as the game had monochromatic graphics on the Game Boy. The reveal took place before it was revealed that the stage was Kirby-themed. Additionally, the Miiverse caption for the aforementioned picture references the Game Boy start-up sequence jingle. Due to the close proximity of the background, no Star KOs occur in this stage; only standard KO blasts and Screen KOs occur. This also applies to its Ω form. This page was last edited on April 16, 2019, at 02:47.